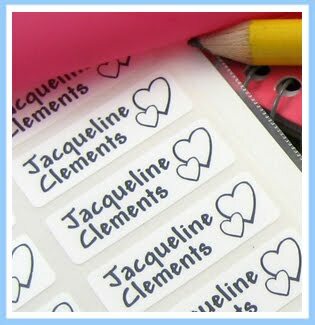 The labels are available with and without icons or with a second line of custom print. To label clothing, sandwich an Applied Label™ with one of our blank backers. For shoes, stick on a Shoe Shield™ that will keep labels in place all year long. For more info on Applied Labels see their website, Twitter page and Facebook page. Instructions for useing: Apply them to a dry and clean surface. Handle the label by the edges to avoid contaminating the adhesive. Place the label and press very firmly, especially on the corners. Wait 24 hours before washing as bond strength builds with time. 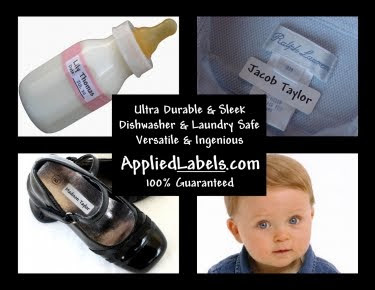 Applied Labels are great for coats, sweaters and uniforms with tags. They are not for use on underwear, socks or tagless T-shirts. disclosure: I received a set of 60 labels with 1 strip of 12 shoes shields and 30 clothing backers valued at $29.40 for this review.